Honorary private hosts in our Mein Papa kommt community offer accommodation at your child's place of residence and across Germany. You can have regular contact with your child despite the geographical distance and your financial constraints. In a temporary children's room of a local kindergarten or of a private host, you can have undisturbed quality time with your child to tinker, cuddle or play during weekends - almost like at home! Mein Papa kommt offers parental coaching tailored to your needs, and practical help for everyday life that takes into account the special demands of a multi-locality family setting. Since May 2018 Dr. Franziska Giffey, Federal Minister of Family Affairs, is Patron of our initiative. In 2012 Mein Papa kommt was honored by German Chancellor Angela Merkel as prize winner in the startsocial competition. Mein Papa kommt is a service provided by Flechtwerk 2+1 gGmbH, a non-profit organisation with a strong expertise in multi-locality family settings. Flechtwerk 2+1 gGmbH is funded by donations and private grants. Check our FAQ for more information about us and our services. Are you interested in our services? Join our community and become a member for only 12 EUR per month. We help you to stay in touch with your child despite your financial constraints. Fill in the form below or send an Email to info@mein-papa-kommt.de. You can also contact us via skype at "daddyiscoming" or by phone at +49 89 929 28 396.
nur Kinderzimmer für Tagesaufenthalt anzeigen. You are looking for an accommodation? In the Search Box (left), enter the name of the place where your child resides and where your are looking for accommodation. The map will show you all the honorary hosts in out network who offer free accommodation. If your are looking for temporary children's room tick the box that says nur Kinderzimmer für Tagesaufenthalt anzeigen. The map will show you all our partners, who offer temporary children's rooms over weekends. You have found a host? Then contact us and become a member for only 12,- EUR/month. We will give you details about the accommodation and its availability. Several hundreds of non-resident fathers and mothers use our service already - generally once to twice a month. If you have not found a host at your child's place of residence, then contact us and we start looking for a suitable host. Should we not succeed within 4 weeks, we will cancel your membership. In 2008 little Sven approached Annette Habert, founder of Mein Papa kommt, and asked for help. 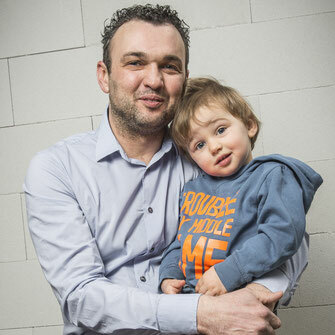 Since the separation, his father spent the nights sleeping in the car every time he came to visit Sven. He could not afford the accommodation expenses. So during wintertime, as it was too cold to sleep in the car, Sven rarely saw his father. Soon Annette Habert recognized that the situation of Sven's father was not an isolated case - the idea of Mein Papa kommt was born. Many children in Germany live hundreds of kilometers apart from one parent, who sometimes even resides abroad. Far from every father and mother can afford the travelling and accommodation expenses that arise due to the geographical distance. And often the non-resident father or mother lacks the supporting network of friends and family at the child's domicile. Our vision is a society in which children can remain in a meaningful relationship with both parents after separation and despite geographical distances and financial constraints. We believe that children have a right to two parents. "Mein Papa kommt" is great because you stay in real homes and you meet people. My kid can find toys and sometimes we have a whole house at our disposal. My child feels like at home.